Black-eyed susans (Rudbeckia hirta) grow as biennials or short-lived perennials. They break dormancy the first year and flower the next. You can sow the seeds outdoors in fall or spring, but they still require some fall preparation for a spring planting. Black-eyed Susans grow in U.S. Department of Agriculture plant hardiness zones 3 through 7, where they perform much like perennials because they readily self-sow. Black-eyed Susans sprout in the spring if you plant them in fall in climates that experience at least three months of temperatures below 40 degrees Fahrenheit. Plant the seeds in early to midfall, about six weeks before the first expected frost. Work a 2-inch-thick layer of compost into the top 8 inches of a well-drained garden bed that receives full summer sun. The plants grow in average soil conditions, so fertilizer amendments aren't necessary. 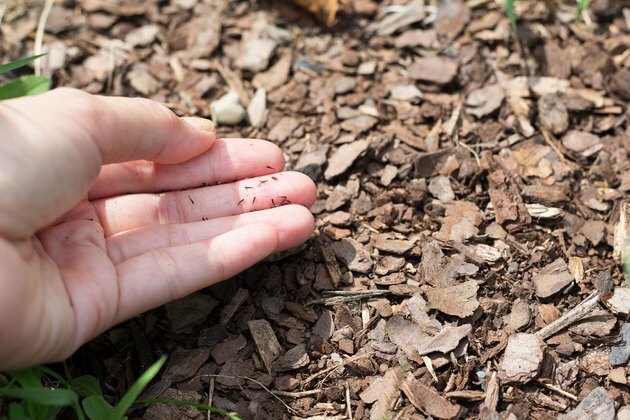 Sow approximately six seeds per square foot and cover them with a 1/4- to 1/2-inch layer of soil. Not all seeds germinate the first year, which is why you need to sow so thickly. Seeds sown in spring require pretreatment if you want flowers the first year. 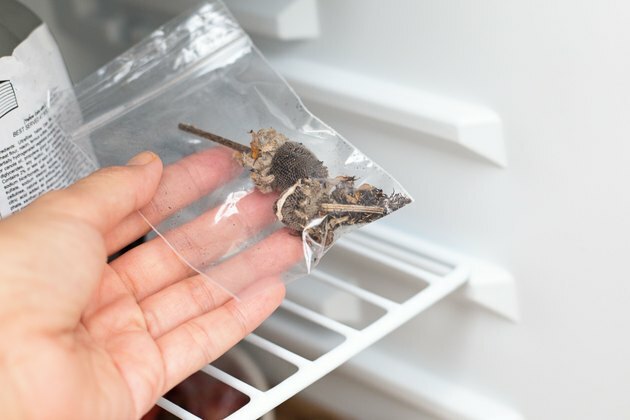 Keep the seeds in a place where it's 40 F or cooler, either outdoors or in the refrigerator, for three months before planting to help the seeds break dormancy. Plant the seeds 1/4-inch deep in the prepared garden bed in spring, after the last frost date. Space the seeds 4 to 6 inches apart in all directions and thin them to the appropriate spacing after they germinate. Indoor-sown black-eyed Susans still require cold treatment to germinate. Pot the seeds in cell packs or 2-inch seedling pots in fall, sowing one or two seeds per container. Use a moistened, sterile seed-starting media to minimize fungal growth. 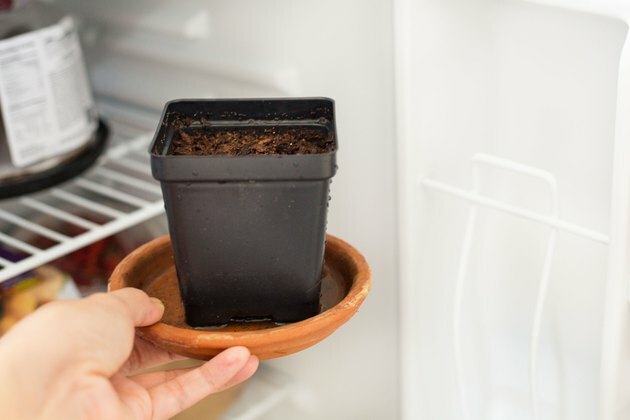 After potting, place the containers in a sealed bag to retain moisture and place the pots outdoors or in the fridge to maintain the 40 F temperature. Take the pots out of cold storage four to six weeks before the last frost date. Provide them with all-day sun and water when the soil surface feels dry. The seedlings should be about 6 inches tall and ready for outdoor transplant by the last expected frost in spring. Plant the seedlings at the same depth they are at in the pot, spacing them 12 inches apart in the garden bed. Moderately moist soil helps ensure germination and healthy seedling growth. Water the bed beginning in spring as needed so the top 6 inches of soil stay moist. Direct-sown seeds will require thinning after they sprout. 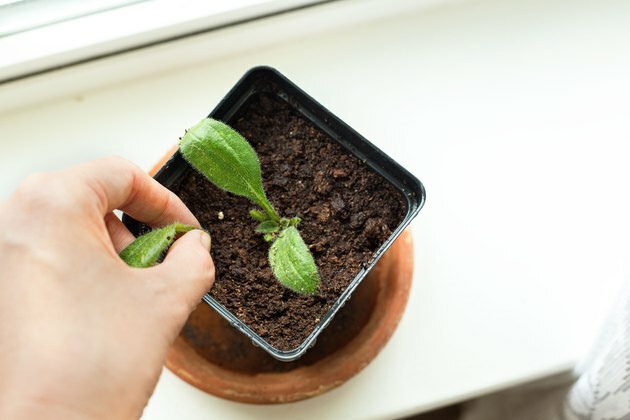 Pinch off the extra seedlings at ground level once the plants begin growing in their second or third set of leaves. 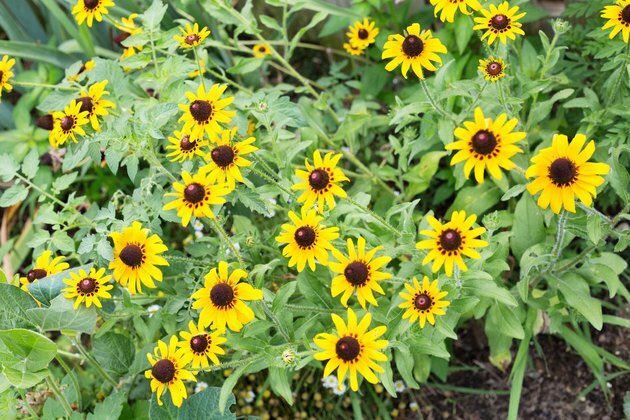 Black-eyed Susan plants grow to a 12 inch spread, so leave about 12 inches between plants. Slugs can destroy the seedlings. Set slug traps around the garden or hand pick the pests from the bed after dark. Once established, black-eyed Susans require little care and rarely suffer from pest problems.